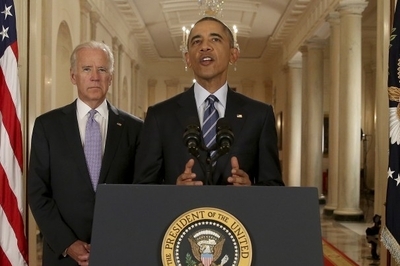 President Obama, flanked by Vice President Biden, announces the nuclear deal reached with Iran on July 14. "You know, the facts are the facts," President Obama declared at his July 15 White House press conference designed to sell the Iran nuclear deal, "and I'm not concerned about what others say about it." He then turned to a host of straw man arguments, punctuated on Sunday with the canards released by Secretary of State John Kerry and Energy Secretary Ernest Moniz, who blitzed all five major Sunday morning news shows. The main supposition from which all other White House arguments flow is summed up in Barack Obama's proclamation, "there really are only two alternatives here. Either the issue of Iran obtaining a nuclear weapon is resolved diplomatically through a negotiation or it's resolved through force, through war. Those are the options." A corollary attribution he ascribes to the deal's critics is, "What I haven't heard is what is your preferred alternative? ... you should have some alternative to present. And I haven't heard that." Yet, Obama goes even further by attempting to paint all the critics as dishonest, saying, "if the alternative is that we should bring Iran to heel through military force, then those critics should say so. And that will be an honest debate." The debate, however, should begin with his answer to why he promised one deal and brought home another. In 2012 Barack Obama declared that the only deal he would accept is one where "they end their nuclear program. It's very straightforward." Quite the opposite, at best the deal reached may delay Iran's acquisition of a nuclear weapon by 15 years, but it legitimizes and protects its nuclear program and paves a direct path for Iran to become a nuclear threshold state, all while filling their coffers with billions of dollars in sanctions relief that can be applied to their terrorist and expansionist activities. If President Obama never intended to end their nuclear program, he should have said so and that would be an honest debate. Dissatisfied with straw men alone, Kerry and Moniz took to the Sunday morning news shows unleashing a flock of canards, representing one falsehood after another. It began with the time-honored tradition of blaming George W. Bush. On CNN's "State of the Union," Kerry claimed that "Iran had 12,000 kilograms of highly enriched uranium [HEU]," enough for 10-12 bombs if further enriched. "They had it. That's what Barack Obama was dealt as a hand when he came in." In reality, according to the IAEA (pdf)—the very agency the Obama administration trusts with verifying Iran's compliance—they had no HEU when Obama took office and only 1,010 kilograms of low enriched uranium in 2009. 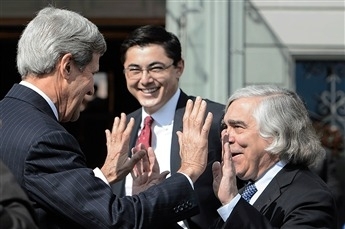 Secretary of State John Kerry slaps hands with Secretary of Energy Ernest Moniz during a break. Instead of the "19,000 centrifuges already spinning" as Kerry claimed, Iran had 3,936 (pdf). Nor were they two months from a breakout capacity, but rather they were just beginning to stockpile the uranium necessary for one bomb, according to the Federation of American Scientists. Iran's significant nuclear progress occurred during the course of Obama's negotiations during which he opposed additional sanctions as leverage to forge a better deal. The idea of "anytime anywhere" IAEA inspections basically means that the agency would have access to suspect nuclear and military sites in roughly 24 hours. It was widely discussed for over a year as a basic necessity for verifying Iran's compliance. At least, that is according to David Albright (pdf), former weapons inspector and president of the Institute for Science and International Security; Olli Heinonen (pdf), a 27 year IAEA veteran; Michael Hayden (pdf), former CIA and NSA director, and; Michael Flynn (pdf), former Obama DIA director. Much like President Obama's promise to end Iran's nuclear program, his negotiating team and closest advisers promised "anytime anywhere" inspections and failed to deliver. When the April agreement in Lausanne had the deal's critics accusing Team Obama of already conceding far too much, Deputy National Security Adviser Ben Rhodes stood before the White House and told CNN's Jake Tapper, "under this deal, you will have anywhere, anytime, 24-7 access" and repeated the claim to Israel Channel 10. Even U.S. Energy Secretary Ernest Moniz told Bloomberg in April "We expect to have anywhere, anytime access". What about these assurances after the U.S. reached an agreement without those inspections? U.S. Under Secretary of State Wendy Sherman—who led six rounds of negotiations with Iran since 2011 and was the lead negotiator of the nuclear talks in the 1990s that failed to prevent North Korea's development of nuclear weapons—told reporters that the term "anytime anyplace" was merely "a rhetorical flourish." This represents a words-don't-mean-things argument but at least it recognizes that the idea was out there. More incredulously, sitting next to Moniz on the Sunday morning news shows, John Kerry told CBS News "Face the Nation" that "this is a term that honestly I never heard in the four years that we were negotiating. It was not on the table." Answering the same question on "Fox News Sunday," he said, "I never, in four years, had a discussion about anywhere, anytime." One must ask, how is what John Kerry claims even possible, and if it is, what level of insulation exists between him and his own staff, let alone between him and the White House? The list of falsehoods promulgated Sunday by Kerry and Moniz went on to include the "snap back" sanctions that don't exist in reality as a penalty for Iranian cheating, the indefensible last-minute U.S. collapse on the conventional arms embargo to Iran, and the list goes on. As for the argument that there's no alternative to this very bad deal, many have been offered and most point to a better agreement rather than a military campaign. Diplomatic alternatives include scrapping the "sunset clause" and upfront sanctions relief or at least making them conditional upon Iranian behavior rather than arbitrary timelines; working out a verification regime of Iran's compliance that stands a chance of working; minimizing the size and scope of Iran's nuclear program to include the permanent dismantling of key components of Iran's program, and; having a system of agreed penalties for an array of Iranian violations so the recourse isn't an all-or-nothing proposition that allows Iran to scrap its commitments to the deal. As President Obama said, "the facts are the facts" but he isn't entitled to make up his own. The critics of this historic deal are asking important questions and have proposed real alternatives. These ideas need to be seriously considered and deserve more than partisan attacks by the Obama administration. If such a fundamental re-shaping of U.S. foreign policy is indeed in America's interest, Congress and the American people should have that "honest debate" based on reality, not talking points. In the end, if the deal is in America's interest and can be sold on its merits, a simple majority vote in favor should be easy for the White House to attain.